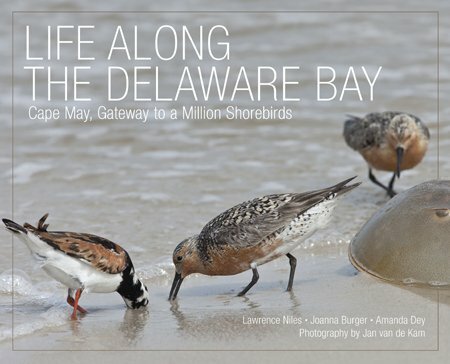 Life Along the Delaware Bay: Cape May, Gateway to a Million Shorebirds, by Lawrence Niles, Joanna Burger, and Amanda Dey, is a book with a mission. Cleverly disguised as a gorgeous photographic celebration of the birds, horseshoe crabs, and ecology of the Delaware Bay, from Cape May to Heislerville to Port Mahon to Lewes (the subtitle is deceptively narrow), this book actually contains a lot of information about the way this natural world works, and how it is now failing to function as it once did. The visual beauty and textual facts are a strong combination. Be careful or you may end up caring deeply about the Delaware Bay and being convinced that this is a significant area we should all work to repair and preserve. 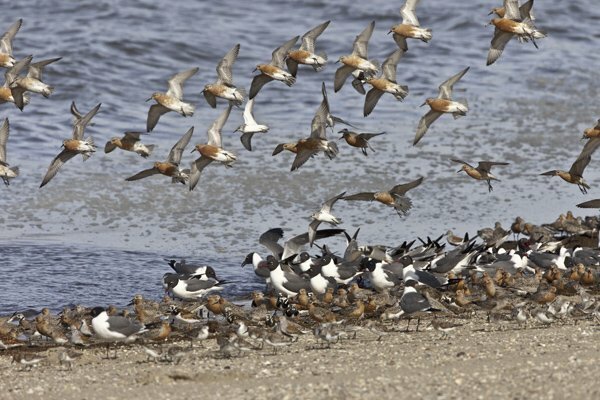 Of course, I jest a bit in the above paragraph because as a sometime New Jersey birder I have birded the Delaware Bay and seen sights such as the memorable image below, in which thousands of Red Knots, Dunlins, and Short-billed Dowitchers fly up as if connected telepathically. This photograph was taken at Reed’s Beach by Jan van de Kam, who did most of the photography for Life Along the Delaware Bay. You simply cannot bird the Delaware Bay and walk away unaffected. 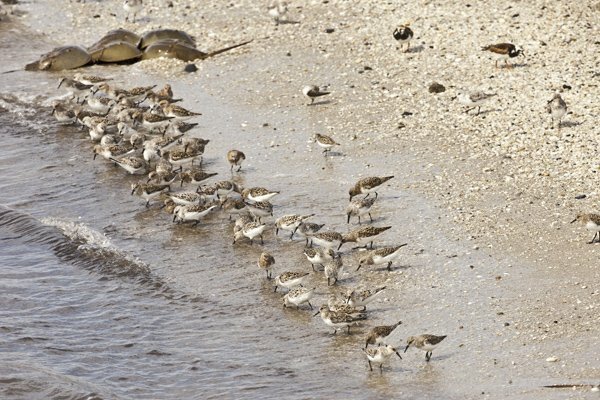 As a Northeast birder I am familiar with the alarming decrease in the number of Red Knots along Atlantic shores and have signed petitions and written e-mails calling for legislation and rules that will limit the overharvesting of the horseshoe crab, whose eggs Red Knots depend on. The numbers, as detailed in this book, are alarming: the horseshoe crab harvest grew from less than 100,000 in 1992 to over 2.5 million in the late 1990’s. Red Knot counts in the 1980’s reached 90,000, the count is now down to approximately 16,000 knots a year. The interlocking wheels of crabs, migration, birds, tides, marsh, beach, fishermen and researchers are described in an unhurried pace in ten chapters. Life Along the Delaware Bay starts with a brief cultural history of the Bay, showing the sod dikes farmers built to drain the marshes, and how Cape May went from being a whaling town to a Victorian beach resort to the home of the Cape May Hawk Watch. The chapter “Horseshoe Crabs” illustrates why this is THE keystone species of the Delaware Bay. Once used as fertilizer, the crabs are now harvested as bait for common whelk and bled for an extract used in medical research. 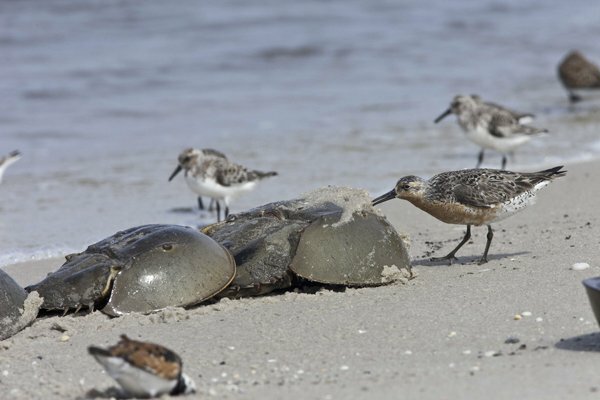 Most articles on the Delaware Bay focus on horseshoe crabs and Red Knots. Life Along the Delaware Bay gives equal attention to other avian denizens of the area with chapters on “Ruddy Turnstones”, “Sanderlings”, “Mud Birds” (Semipalmated Sandpipers, Short-billed Dowitchers, Dunlin, Plovers), and “Gulls”. All of these species are reliant, more or less, on the horseshoe crab, and they also need the Delaware Bay as a stopover on their migration routes. The authors and photographer celebrate the beauty and uniqueness of each species (Ruddy Turnstones are dramatically aggressive, Sanderlings’ penchant for running at the surf makes them vulnerable to oil spills), while illustrating the challenges of managing the Delaware Bay habitat. The shorebirds and gulls not only need to feed, they need to roost. 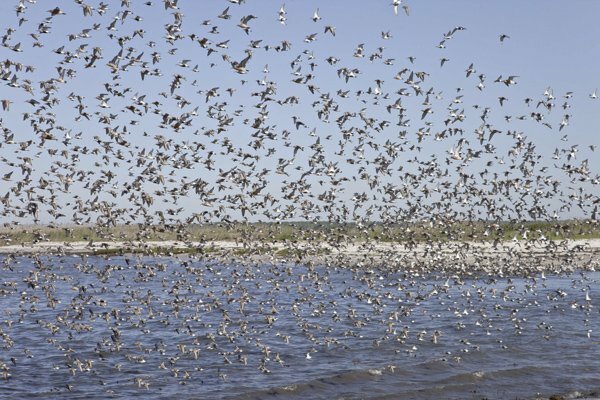 What makes good roost sites and how can the waterfowl impoundments in New Jersey and Delaware be managed to provide them? Laughing Gulls compete with shorebirds for food both spatially (preventing them from having access to the tide areas where horseshoe crab eggs are located) and directly (eating the eggs). Should the gulls be controlled? Can the gulls be controlled? Fans of the Laughing Gull (called true “Jersey gulls”) will be relieved to learn that the authors believe that the answer to both questions is a solid no. Descriptions of ongoing and past research, much of it performed or directed by the authors and contributors, are interwoven throughout the book. Photographs illustrate data collection: cannon nets capturing the birds, scientists and volunteers running to cover them and then place them in burlap cages, the weighing and banding and lately, for the Red Knots, fitting them with geolocators that, if recaptured, give a picture of the long-distance migratory movements of the bird. One bird, the authors discovered, flew 5,000 miles nonstop from southern Brazil to North Carolina. I enjoyed looking at the photographs of the researchers and volunteers almost as much as I enjoyed looking at the bird images; it looks like fun, hard work. 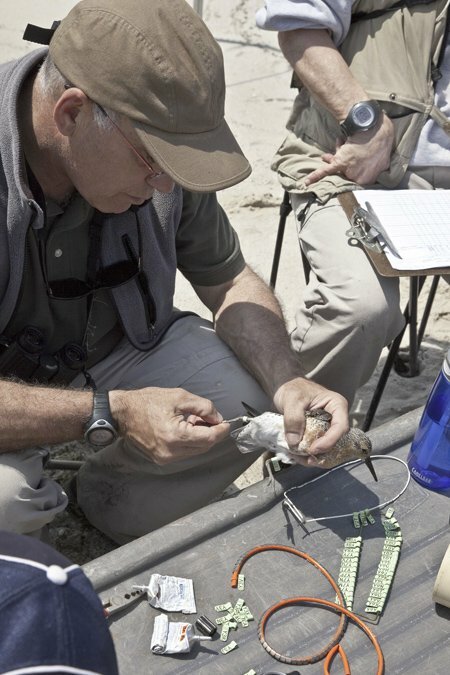 The three co-authors of Life Along the Delaware Bay are scientists who know how to write about science without jargon or pretense. Lawrence Niles was chief of New Jersey’s Endangered and Nongame Species Program for fifteen years and now works for the Conserve Wildlife Foundation of New Jersey, a sponsor of this book. Joanna Burger is known both for her ecological research based at Rutgers University, where she is a professor, and for books like A Naturalist Along the Jersey Shore, which celebrate the state’s natural riches. Amanda Dey principal zoologist for the State of New Jersey Department of Environmental Protection (and spouse of Larry Niles) has researched Red Knots and other Delaware Bay shorebirds for over ten years. Describing an ecosystem, with all its different strands and relationships, is not easy. Niles, Burger, and Dey bring together concepts such as migratory flyways, plumage and molt, spatial competition (I love that term), tidal flow and water exchanges almost effortlessly. They use the photographs as part of the textual flow. Ah, the photographs! They are simply amazing, as I think you can see from the examples here. Jan van de Kamp is a Dutch wildlife photographer who has previously photographed migrating shorebirds passing through the Yellow Sea for a book called Invisible Connections; , like this one it seeks too raise public consciousness. His close-ups of Red Knots and Ruddy Turnstones are excellent studies; his images of flocks of shorebirds in flight or feeding on the beach are simply breathtaking. Additional photographic contributors including Kevin Karlson. Even if you know all there is to know about the Delaware Bay, if you love shorebirds you will want to have this book. The design and composition of Life Along the Delaware Bay, credited to Ellen C. Dawson, is also notable, as are the book’s production values. So yes, seriously consider purchasing this book if you are a shorebird fan. And, if you appreciate excellent nature photography. Also, if you regularly bird Cape May and the larger Delaware Bay area. And, if you want to see a good example of how to convincingly present a case for conservation. And, then consider giving this book as a gift to relatives and friends who may not be birders or naturalists, but who would enjoy learning more about the place where they summer or fish or once took a vacation. This is not an inexpensive book, but it is not as costly as it should be, considering its quality. Fortunately, its publication was sponsored by several organizations and corporations, including the Conserve Wildlife Foundation of New Jersey, Citizens United to Protect the Maurice River andy its Tributaries, Sun National Bank, the National Park Service, and New Jersey Natural Land Trust. The last chapter of Life Along the Delaware Bay is called “Against the Tide: Threats and Conservation Efforts”. It is sad to read about oil spills and global climate change, but it is encouraging to know that land acquisition programs and habitat restoration projects are effectively restoring beaches and roosting sites. I also liked the authors’ emphasis on the Delaware Bay as a place that can and should accommodate birders and fishermen as well as wildlife. It is nice to feel appreciated, and the next time I bird Heislerville I will certainly be more conscious of the “elegant” ecosystem I am observing. If you have had the joy of birding the Delaware Bay (remember, this includes Cape May in New Jersey and Prime Hook in Delaware), what has been your most memorable experience? And, what bird do you think symbolizes this area–the Red Knot, the Laughing Gull, or a bird I haven’t even mentioned at all yet in this review, like the evasive Marsh Wren? by Lawrence Niles, Joanna Burger, Amanda Dey, and Jan Van de Kam, Photographer. With contributions from Kevin Kalasz, David Mizrahi, Humphrey Sitters. Rutgers University Press/Rivergate Books, 2012. 176p. All photographs used in this article are by Jan Van de Kam and used courtesy of Rutgers University Press. What a cool book! How to pick out the most memorable experience from such a bird-rich area? Witnessing thousands of Great Blue Herons steadily moving south on heavy, flapping wings. Seeing hordes of shorebirds in a feeding frenzy almost too close for binoculars. Watching people of all ages marvel over Merlins, Peregrines, and other raptors at the Cape May hawkwatch. A truly special place for birding. The Red Knot gets my vote for the species that best symbolizes the area. What a fine review, Donna; thank you. It’s a great book. I say Red Knot over Laughing Gull! Definitely. I’ve been visiting Mahon Road for years, and it has been very upsetting to see less and less Red Knots every year. It sounds like they are working on this problem. If they can do for the Red Knot what they’ve done for the Bald Eagle, then I will be very happy. Thank you, Rick, I appreciate the positive comment from a very experienced bird book reviewer. Evie, I agree totally. I’ve only been birding since 2004, so I never had the experience to see the Red Knots on Mahon Road as they used to be, numbering in the thousands. Hopefully, I will be able to see that in the near (or far) future. Jon: Sorry, I don’t know this book. I’ll do some more searching.